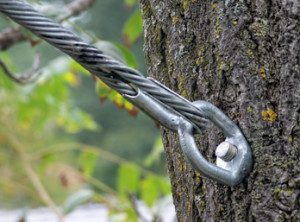 Cabling and bracing are methods of improving the structural support of trees or particular branches that may be at risk of falling, particularly during storms or high winds. Structural failure can easily be prevented through a combination of cabling, bracing and pruning–all of which serve to distribute the weight of the tree more evenly and provide more stability. Cabling and bracing services should only be performed by a certified arborist since they require a high level of expertise and knowledge. Cabling – After an arborist has assessed the tree or trees that you need cabled, they install cables through a series of threaded bolts, which provide the structural integrity needed to grow properly. Once the process of cabling is completed, the tree will eventually grow over the bolts. Periodic adjustment may be necessary in some cases to ensure that cables are properly situated so that the tree may grow normally, and to check for excessive growth in areas around the threaded cables. Want to know more about cabling and bracing? This resource covers many of the basics, including how it works and what sort of issues you can prevent through early detection. Bracing – Bracing is a great way to ensure that smaller trees are able to grow and develop naturally and safely. If you have any concerns about damage caused by wind or storms, especially for smaller trees, bracing is a good idea. Smaller trees can often be braced with just one stake, making it a simple and affordable method of guarding against erratic growth, split trunks, and falling branches. Larger trees will generally require the use of several stakes, and must be monitored over time to ensure that the braces don’t impede the development of the root system. Need tree cabling or bracing services in Santa Cruz or Monterey? Give us a call at (831) 508-8995 to learn more about how we can help! We are happy to offer FREE cost estimates that are tailored to your specific needs!